How old is the School of Pharmacy? Who founded it? How old is the present building? When did the first class graduate? What are the names of the deans and what years did they serve as dean? How many graduates have earned the Pharm.D. degree? How many total graduates has the school had? What are the school's vision, mission and values statements? Which graduates have been selected as the School of Pharmacy Outstanding Alumni? 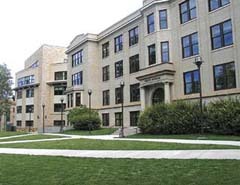 The UW School of Pharmacy was founded in fall 1946 under the leadership of the first dean, David W. O'Day, as part of an expansion of university offerings by UW President George Duke Humphrey following World War II. For more information, please see the History of the School page, located here. The pharmacy program was housed in Merica Hall, the former women's dormitory just east of Old Main. Merica Hall was then called the Merica Pharmacy Building. Read more here. The present building was completed in 1969 and is now located in the north wing of the newly upgraded $20 million Health Sciences Center which opened its doors to students in fall 2005. The school started with a student body of 23 students in 1946. The first class graduated in 1950. The school has graduated a class every year other than 1999 during the transition from the B.S.P. degree to the Pharm.D. degree. The school began offering a four-year bachelor of science degree and has grown into a six-year doctor of pharmacy (Pharm.D.) program with 52 students in each class. The first Pharm.D. class (Doctor of Pharmacy) graduated in 2000. As of May 2014, there have been 683 graduates with a Pharm.D. degree. As of May 2014, there have been 2,155 graduates. University of Wyoming’s Doctor of Pharmacy program is accredited by the Accreditation Council for Pharmacy Education, 135 South LaSalle Street, Suite 4100, Chicago, IL 60503, 312/664-3575; FAX 312/664-4652, web site www.acpe-accredit.org. Please see the Vision and Mission page, located here.